On Tuesday 15 May afternoon, after a meeting at the French National Museum of Natural History, I walked to Le Jardin du Luxembourg, the twenty-two-hectare public park located at the heart of Paris next to the Latin Quarter. I wanted to see its orchard and maybe meet one of the gardeners who takes care of it. ‘Le Jardin du Luxembourg’ at the Luxembourg Palace, home to the French Senate. I knew the park well; however, I had never seen its orchard. Right: an orange tree. It reminded me of the citrus fruit collection of the Medici family in sixteenth century Tuscany, which I read about a month ago. Photo 15 May, Paris, France. I had a book with me, La Collection Fruitière du Jardin du Luxembourg1 (The Luxembourg Gardens Fruit Collection), which I had purchased during the weekend. It would prove an invaluable resource for understanding the history of the collection and what it is today. Extracts of this book published in 2016 are available on Calaméo1. Photo 31 May. I walked through the park from the North-East entrance, knowing approximately the orchard’s location, in the South-West corner. I still had to ask to find my way: it is a small place, which accounts for one percent of the park area. My first contact with the fruit collection at Luxembourg Gardens: well groomed trees looking like candelabra-shaped sentinels guarding the place. Photo 15 May. There was activity in the garden, and I did find a gardener. I had been given the names of the gardeners by the Croqueurs de Pommes, a partner organisation of the Luxembourg fruit collection of which I am a member. So it was not difficult to make contact. We had a quick chat and I was offered the opportunity to come back the day after to visit the inside of the orchard. We made an appointment for Wednesday 11:00am. I took advantage of the end of the afternoon to sit on a Luxembourg chair next to the main pool and read some chapters of my book. I focused on ‘The orchard today’, particularly ‘The fruit collection’ and its evolution (p66-73) and ‘The remarkable tree forms of the Luxembourg Gardens’ (p100-102)1. Then I came back to the orchard to take a few more photos. I found the gobelets accolés en livre ouvert (literally ‘contiguous goblets in open book’), created by Léon Cuny, curator of the collection from 1923 to 1952. ‘The micro-climate generated by this V shape enables to produce fruit of an unparalleled quality’ (p101). A line of ‘gobelets accolés en livre ouvert’. This shape was created more than a century after the Carthusian monks who once lived and practiced arboriculture in this place left the area. As for the gobelet à 16 branches obliques (goblet-shaped system with 16 oblique branches crossing over), this ‘particularly sophisticated and elegant’ form was created n 1995 by Jean-Yves Prat, one of the book’s authors (p102). ‘Gobelet à 16 branches obliques’. The picture shown in ‘La Collection Fruitière du Jardin du Luxembourg’1, taken in winter, is more illustrative of the sophistication and elegance of this tree form. 600 varieties, including 300 apples and 230 pears, are currently grown in the orchard, with a total of 1,000 trees on 2,500 square meters (p66). What interested me most was the re-introduction of old varieties, which started during Jean-Noël Burre’s 1973-2004 curation of the collection (p70). It coincided with the growing concerns about the loss of varietal diversity that emerged in the seventies, and was the beginning of the actions taken to safeguard biodiversity, a major sustainable development issue on our planet today. Here is where the Carthusians come into play. 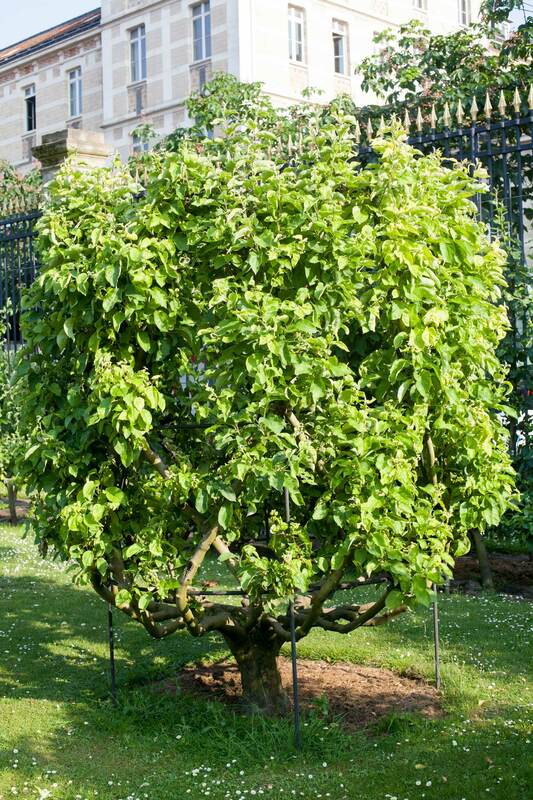 The monks who once lived in a monastery adjacent to the Luxembourg palace and gardens and practiced arboriculture (see history chapter below) contributed to the diversity of fruit varieties that humans have created over the centuries. Their contribution was so significant that in 1995, the Luxembourg fruit collection was labelled ‘national collection of fruit trees cultivated by the Carthusians during the eighteenth century’ (p71). Research is being carried out to retrieve Carthusian varieties, many of which were lost over time, and replant them in the orchard. Various methods are combined, including desk research, location of existing trees and genetic sequencing. In 2016, 124 out of the 591 varieties present in the collection were labelled as Carthusian. They can be easily recognized in the orchard: there is a monk drawn on the label displayed next to the tree. 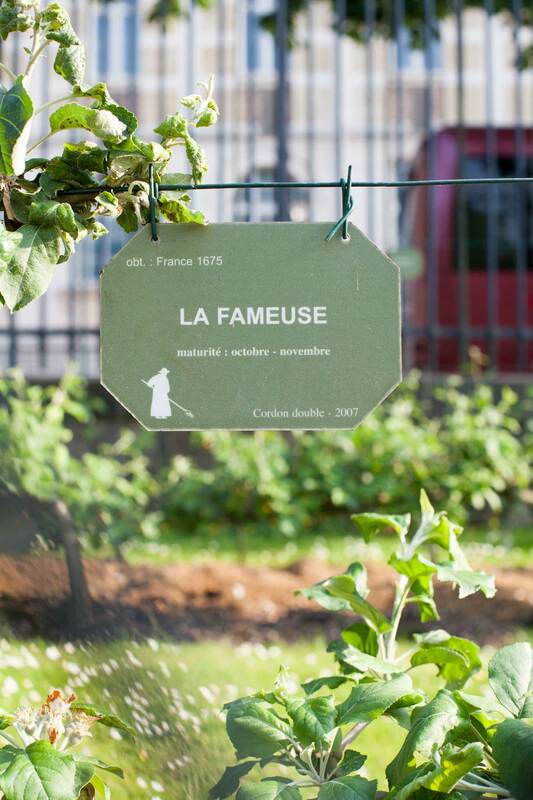 ‘La Fameuse’ is labelled as Carthusian in the Luxembourg fruit collection, and graded as ‘very good’, the top rank in ‘fruit quality’ in the collection’s records. In the twenty-first century, this apple is not very well known, so would be better described as ‘delicious’, the other meaning of ‘fameuse’ in the French language. But how was it perceived in previous centuries? Was it also famous? Yes, at least in Canada. According to the Canadian blog ‘Potagers d’Antan’, ‘La Fameuse’ arrived in Canada during the seventeenth century, and travelled back to the UK, where this ‘magnificent fruit’ ‘achieved great success’ in horticultural exhibitions (Robert Shepherd, 1818, quoted in potagersdantan.com)2. The pomology site FruitId mentions that ‘for well over a hundred years, it (the Fameuse, or snow apple) was the most popular, widely cultivated variety in Quebec’3. Beyond the involvement of the Carthusian monks in the propagation of ‘La Fameuse’, I personally find this variety of particular interest. The claim that it reveals its best organoleptic qualities when growing in hardy conditions makes it a good choice for an orchard of heritage varieties in the mountains where I live. My exploration of the Luxembourg fruit collection on 15 May raised my curiosity. I wanted to know more, in particular about its history. Here is the outcome of the desk research I carried out to that end in the past fortnight. 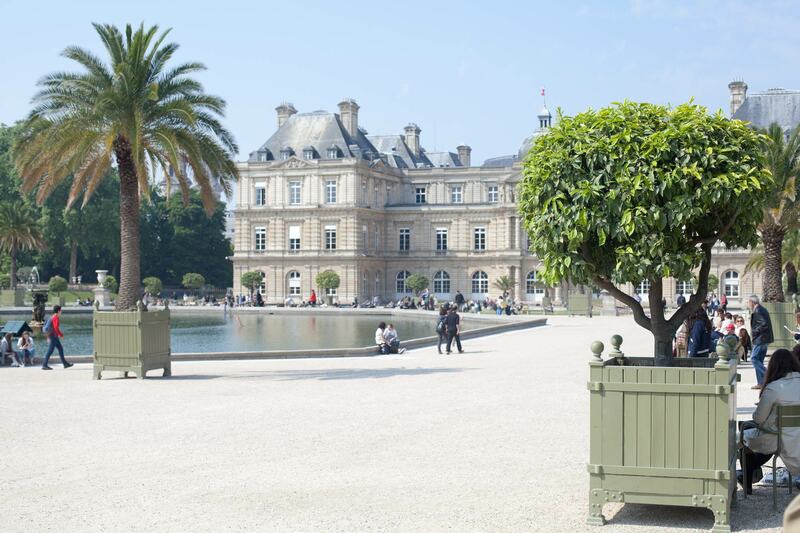 The Luxembourg palace and park may appear as a peaceful place of timeless wonder to its visitors today. It has been mostly untouched for 130 years, after the park’s borders and landscape were redesigned in 1866. However, the history of its orchard has been a tumultuous one. 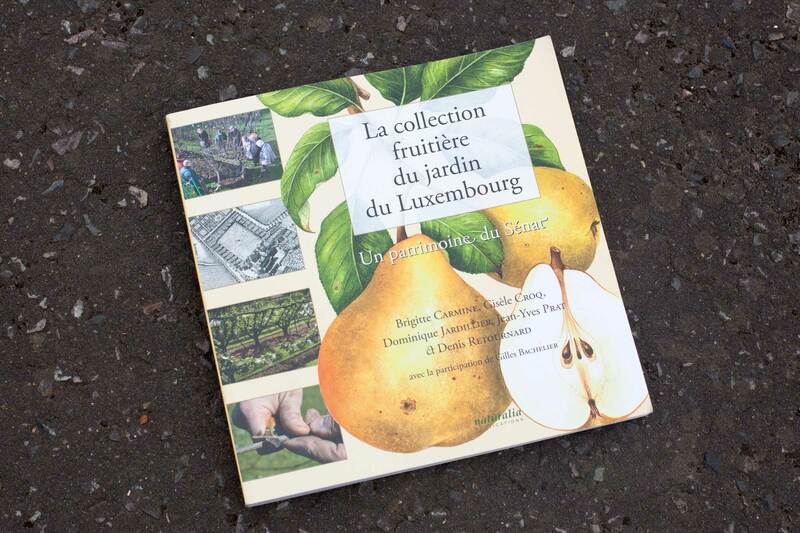 According to the authors of La Collection Fruitière du Jardin du Luxembourg1, the story of the Luxembourg fruit collection started around 1650. This is when the Carthusian community of the monastery of Vauvert, adjacent to the Luxembourg palace and gardens, asked Frère Alexis, a new brother coming from civil society with a cutting-edge knowledge of arboricultural techniques gained in the nurseries of Vitry-sur-Seine, to create their own fruit tree nursery. What would become a remarkable fruit tree collection and nursery covering several hectares of the Carthusians’ domain was born. The nursery became internationally recognised in the eighteenth century for the quality of its trees and the services it provided, for instance how the trees were packed and labelled for shipment. However, when clerical property was confiscated by the French nation during the revolution of 1789, the monks had to leave. What the Carthusians had made of the castle of Vauvert, a derelict domain occupied by robbers given to them in 1257 by king Saint Louis, was to suffer the consequences of the century-long political instability that followed the French Revolution. More about the history of the Carthusians fruit collection and nursery in the monastery of Vauvert can be found in La Collection Fruitière du Jardin du Luxembourg1 (p9-18). The history of the large fruit nursery after the French Revolution, under public governance, would prove quite tumultuous until its demise in 1866 (p18-56). Photo 31 May. 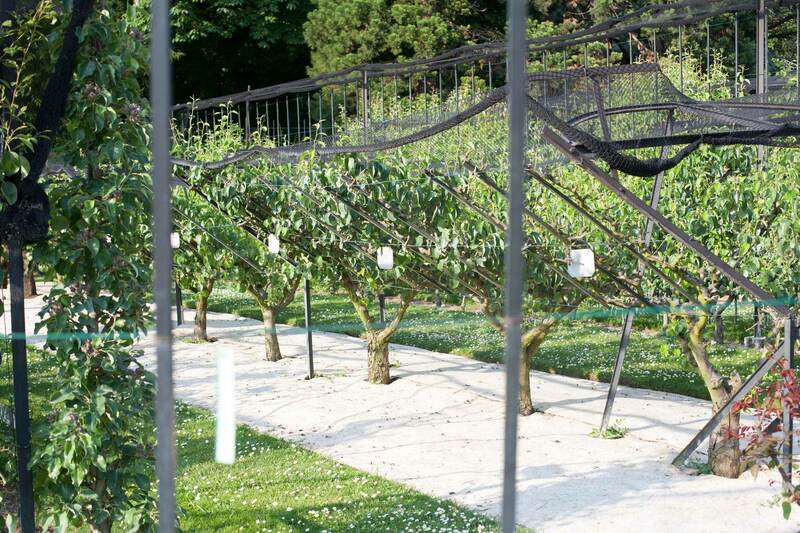 Although the current orchard is very small compared to the former Carthusian nurseries, it is remarkable that such a fruit collection still exists in the very urbanised centre of Paris. In fact, it benefited from continuous protection by the French political authorities after the 1789 revolution, in particular those who had their offices in the Luxembourg palace. They didn’t manage to save the nursery, which was handed back to central government by Napoleon III in 1866 for urban development, but they saved the collection. This support continues today. As far as I understand, the maintenance and the development of the fruit collection is paid for by the Senate, the second parliamentary chamber of the French political system which sits in the Luxembourg. I would argue that this support by the French Senate is not just a tribute to the past history of the Carthusian nursery and the excellence of the horticultural practices that made it prestigious. It is also in my view the result of a wider interest of this institution in cultural heritage and of an earlier connection of the Luxembourg with fruit collections, which stemmed from the Italian Renaissance and the influence of the Medici family. My point on cultural heritage is easy to evidence: in maintaining and developing the Luxembourg, the Senate, in its words, is ‘scrupulously respecting this exceptional treasure of Parisian architecture’4. The presence of an orangerie sheltering 180 potted plants including 60 citrus trees in today’s Luxembourg gardens5 gives a hint in relation to my second point on fruit collections. The Luxembourg palace and gardens were designed and built between 1612 and 1631 by Marie de Médicis, regent of French king Louis XIII6. The queen was brought up in Palazzo Pitti in Florence, Italy, close to her family’s citrus fruit collection. This was not just a fruit collection. ‘The Medici family’s collection in Florence was indisputably the finest in Europe’ (Attlee 2015, p10)7. Palazzo Pitti’s Boboli gardens, where part of the collection grew, influenced Marie de Médicis’ design of the Luxembourg. ‘She drew on her Tuscan heritage in an attempt to recreate the impressive grandeur of the Florentine garden which, historically, had been manipulated to exalt the status of the Grand-dukes’ (Coombes 1992, p4)8. It is unclear to what extent Marie was interested in fruit trees. However, her mentors, three generations of Medici grand-dukes who kept a close eye on her adopted country after her arranged marriage to Henri IV in 1600 (Coombes, p2-3), considered their fruit collection in Florence as a marker of their grandeur (Attlee, ‘Citrus collectors in Renaissance Tuscany’ chapter, p5-27). The first of the three, Ferdinand I, ‘supplied his niece (Marie) with oranges, lemons, and even the seeds of cauliflower for her gardens ln France’ (Coombes, p39). Is it fair to say that fruit trees, at least of citrus varieties, and by extension fruit collections, because of the Medici legacy, have been part of the Luxembourg DNA right from the creation of the palace in 1612? Apples, pears and other temperate fruits entered the history of the Luxembourg at a later stage. The fruit collection assembled by the Carthusians in Vauvert was developed independently from the palace. Coombes mentions several times in her thesis the wall that separated the two properties and Marie de Médicis’ agreement not to disturb the monastery. The fruit stories of the two places only intertwined after the French Revolution, in the absence of the monks. They had evolved separately until then. The growing popularity of fruit collections in the palaces and gardens of prominent families in Europe had led for instance to the creation of the Potager du Roi and the Orangerie in Versailles, whilst the Carthusians had become merchants of their trees. 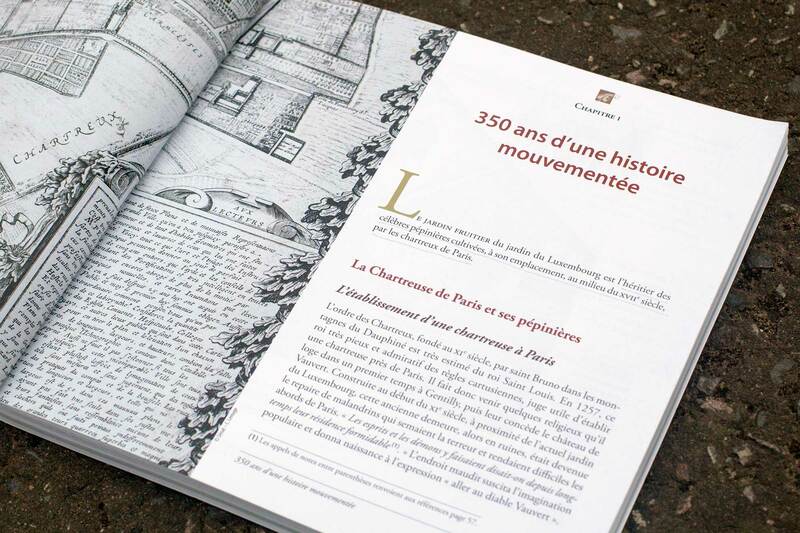 The authors of La Collection Fruitière du Jardin du Luxembourg mention that the current orchard is located on the former Carthusian site. I illustrated this by superposing an image of the Luxembourg Gardens today (Jardin du Luxembourg visitor leaflet9) on a blurred image of the area in 1790 (source Wikimedia10). 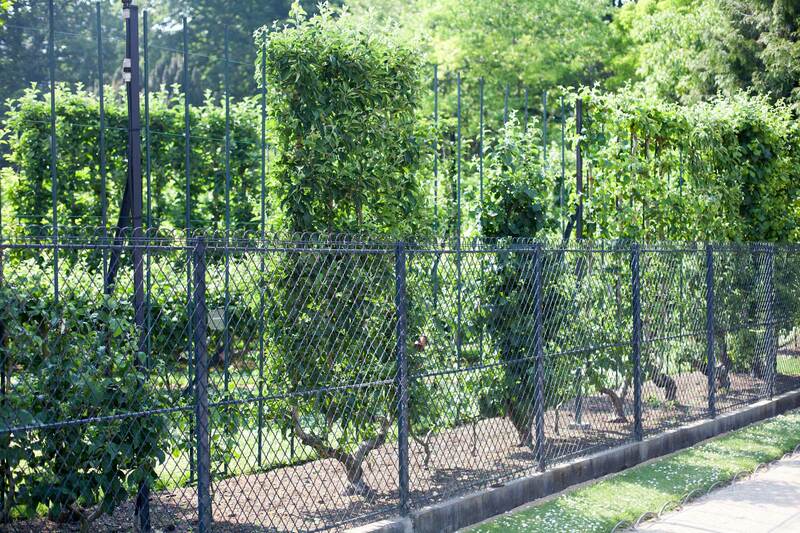 It enables to visualise the gap between the current size of the orchard and that of the nursery in former centuries. 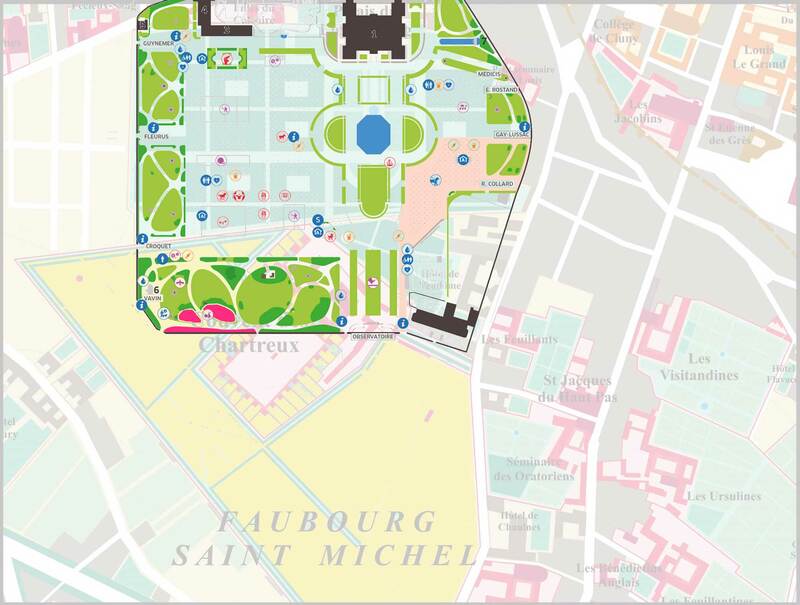 The Luxembourg orchard today (in pink, bottom left of today’s Luxembourg park) is very small compared to the ‘immense’ fruit tree nurseries which covered several hectares of the Carthusian monks farmland (in yellow) in 1790 (p171). As a conclusion to this historical chapter, I would say that the attachment of the Senate to the Luxembourg’s collection of temperate fruits also stems from the deep cultural roots that influenced the construction of the palace 400 years ago. The remarkable work of the monks has been valued and their heritage varieties of apples, pears and other fruits are back in the collection, while the enlightened spirits of the grand-dukes of Tuscany and the architects of French civil society continue to protect and promote this wealth at Luxembourg. In the end, I didn’t meet with gardener Franck Delalex in the Luxembourg orchard on Wednesday 16 May. We had a phone conversation instead, and I have since proposed a plan for my next visit. There are many more things I would like to learn about the collection. For instance, I would like to see the gardeners harvest the fruits matured in pouches. It would also be great to taste an apple or a pear grown in the microclimate generated by the gobelets accolés en livre ouvert. I am also interested in arboricultural techniques and scientific research. I feel there is a kind of continuity between the monastic ways in which Carthusian monks worshiped through work in their Vauvert monastery and the meticulous methods now applied by scientists and gardeners to improve our knowledge and practice of arboriculture at Luxembourg. These ways of working have proven to be very productive. This entry was posted in Stories and tagged France, Paris by Les Jardins d'ici. Bookmark the permalink. Absolutely facinating thank you for the insight into a beautiful architectural Parisian pomme world. The pruning/training techniques they do on those fruit trees are fascinating. 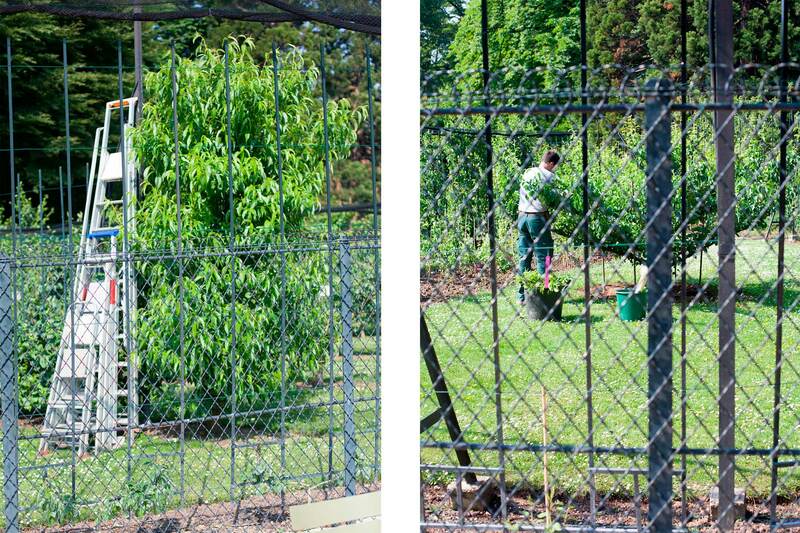 Seems like a great way to fit a lot of fruit trees into space-constrained urban environments.